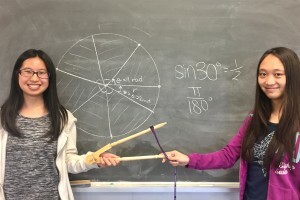 The grade 10 students recently began their study of trigonometry. After reviewing the primary trigonometric ratios, students learned how to express angles in radians in addition to degrees. They will be assessed on their knowledge of special trigonometric ratios through dictation quizzes, which will prompt students to answer questions both quickly and accurately.